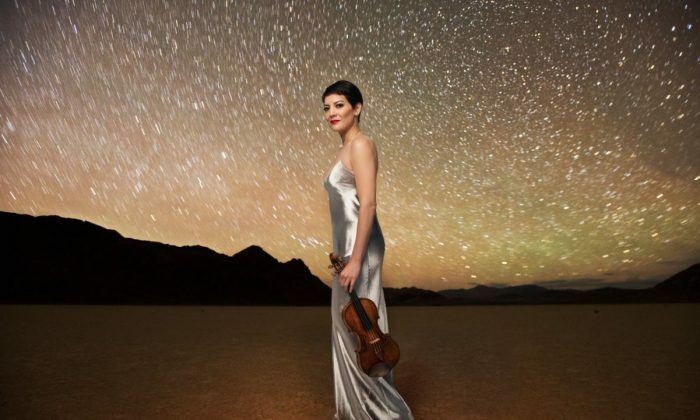 American violinist Anne Akiko Meyers radiates inspiration. It’s a result of her being ever-inspired by everything around her. She strives to absorb rich experiences from the world and art around her, from food and music and paintings, from her husband and two young daughters, and weave from it all a rich tapestry in which her music exists. Virtuosos do more than demonstrate great skill; they broaden our understanding of what can be done with the instrument. And Meyers certainly does so with the violin. Her love for music began before she was born. Her mother had read many books on how important music is to a baby’s brain, and so Meyers had been listening to classical music in the womb. At age 4, she picked up a violin upside-down and took to it immediately. “My father put it the right side up and said, ‘Actually, you hold it this way,’ and I’m to this day trying to figure out how to play it, 42 years later,” Meyers said. To try to play the violin is to commit your life to the craft, she said, to train and train to play the physically demanding instrument, and to express as much life and color as you can through it. Meyers is known for the passion she brings to the music she plays, and her ability to resonate with audiences. She feels deeply and has the skill to channel it through her instrument, through the language of classical music. “Classical music is a language that is so rich and so expressive. It’s just part of my DNA,” she said. Having studied the greats of classical music—Mozart, Beethoven, Schubert—Meyers realized that we all come from such a deep place. Her study of the classics got her interested in what this language of classical music can be used for today. She has become a champion of classical music, collaborating with many great contemporary composers to create new works for the violin. This is always on her mind when working with composers today, and she is fascinated with that creative process. She has commissioned and premiered works by composers like Mason Bates, John Corigliano, Brad Dechter, Jennifer Higdon, Adam Schoenberg, Joseph Schwantner, Wynton Marsalis, and many others. Meyers enjoys project-based work, and many of her albums and programs showcase her masterful rendering of magical and dreamy works in her visceral way that sparks the senses. The concept begins with one of the last works written by the late composer Einojuhani Rautavaara, who passed away just this summer. Meyers, a lifelong fan of the composer, had reached out to Rautavaara’s publisher during the spring of 2015 with the idea of a 15-minute fantasy, a free-form piece. To her delight he soon accepted, and at the end of summer she received a handwritten score. She immediately ran to the studio to play it through. At the 92Y, the venue where Meyers remembers making her New York recital debut, she will perform the world premiere of this “Fantasia” arranged for violin and piano. She will also premiere an arrangement by Morten Lauridsen—another composer noted for his mythical, mystical works—for violin and piano. The American composer’s choral works are among the most performed in the country, and Meyers had wanted him to write a violin piece to no avail. But after witnessing a performance of her’s, he offered to do an arrangement of “O Magnum Mysterium” for violin and she happily agreed. Also on the program is “Fratres” by Estonian composer Arvo Part, the most-played living composer today and another one of Meyers’s heroes. She had the opportunity to collaborate with Part to record some of his works, and, in a video interview afterwards, talked about how deeply his music resonated with her. “It’s like reading a Bible. It’s looking into a mirror and really analyzing yourself, going really deep within yourself,” she had said. “It’s a really fascinating look at music that’s currently being composed today, as well as going back to Beethoven and Ravel and bringing those colors back to life,” Meyers said. Many of the same works appear on Meyers’s “Fantasia” album to be released in the spring. Meyers knew early on that she wanted to play the violin for life; that she wanted to go out and perform on the violin everywhere. And she did. At age 11, she made her debut with the Los Angeles Philharmonic, and the year after that soloed with Zubin Mehta and the New York Philharmonic. In 1993, she was the only musician to be granted the prestigious Avery Fisher Career Grant, which is awarded to up to five musicians annually. For over 30 years, she has kept an extensive touring schedule and continues to collaborate with artists all over the world. She is a top-selling musician in her genre. A great musical performance is a visceral experience, she says. Like having a great meal or finishing a great book, it leaves you thinking of things in a different way, and it can change your life. “Responding to and sharing the music with the audience and really delving into the music and trying to create something beautiful is what I am trying to do, what I am trying to create,” she said. There are no sound post patches, nor cracks of any kind; it’s as if the violin just left the workbench of the master crafter of violins. The violin, nicknamed the Vieuxtemps, once belonged to the Belgian violinist Henri Vieuxtemps in the 19th century and has been used by Yehudi Menuhin, Itzhak Perlman, Pinchas Zukerman, and Eugene Ysaye. It is considered one of the most magnificent violins in existence—and one of the most expensive, netting $16 million from an anonymous buyer in a sale in 2012. Meyers was gifted the violin as a lifetime loan. “It resonates and has a projection like none other,” she said. Meyers has played on many Stradivarius violins over the course of her career and knows intimately that the violins by these master artisans are one of a kind. “It’s like I’ve finally culminated, did a 180 after playing so many violins,” she said. She feels lucky for the experience, a deep sense of responsibility to safeguard the violin, and extraordinarily at peace with the powerful instrument in her hands.